This is the official website of Isaac Florentine. Here you can find every important information about him, his work and his background. Isaac Florentine is fast becoming recognized as a director who brings a refreshing new voice to filmmaking. 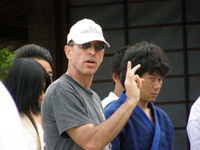 Having over ten features and over one hundred and twenty television episodes under his belt, Isaac has proven his ability to bring leadership to the set, while providing the project with his own unique artistic flair. Isaac Florentine started his Martial Arts training back in 1971 in Tel Aviv Israel. Training in Judo first, and then Karate. He started instructing Karate in 1978, while in the Army. He first taught cadets in the Air Force Technical School, then after completing his military service he started teaching at his former high school in Tel Aviv. Isaac Florentine has a wife and four children who give him strength and support for his next projects.